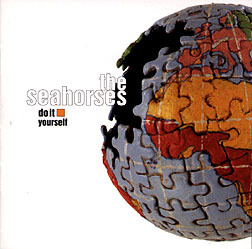 CD Review: The Seahorses, "Do It Yourself"
And this, dear readers, is the postscript to the epic story of a band which held the hopes of a generation in its hands and ended up losing the lot, disintegrating one member at a time, not with a bang but with a sordid whimper. These selections are from songs that Squire penned. Vocalist Chris Helme also pens three tracks and they're marginally better than Squire's by virtue of better lyrical sense, more than one can say for the cliché-athon of "Love Me and Leave Me," which owes its words to none other than Liam Gallagher. And the music? Veteran producer Tony Visconti can't prevent more Black Crowes than T.Rex from appearing here, and it's a telling thing that the best music on the album is a sample of "Greensleeves" played on a music box. Once upon a time, a John Squire guitar solo -- "I am the Resurrection," for example -- could make you feel like you were on top of Mt. Everest and that you owned the world. Now he's just an embarrassment.